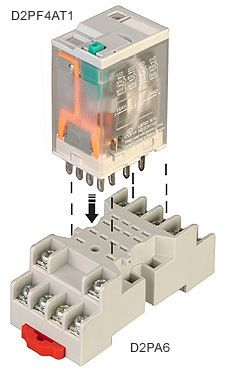 The D2PF series relays are general purpose plug-in style relays. These 4PDT relays are extremely compact and are available with coil voltage of 24 Vdc and 120 Vac. The D2PF series offer a number of enhanced features including LED status lamp, push-totest button for manual relay operation, a convenient finger grip for removing relays and a write-on label that can be used for identifying the relay in multiple relay circuits.